I don't know about where you live. But spring in my state means very unpredictable weather. It can be sunny and 70 one minute and snowing sleet 10 minutes later and back to sunshine after that. Besides cold winds and spring snow. Thunderstorms and rain showers are also a huge possibility over the next few months. One thing is sure, if you plan to run spring races, chances of you seeing a spring rain storm or snow storm are on the higher end of probability. 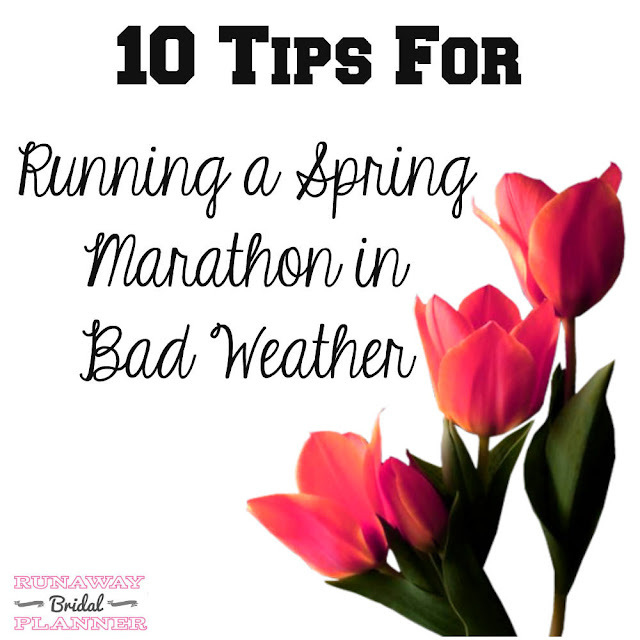 Which is why, I want to share 10 tips for running a spring race in bad weather. 2. A good garbage bag. Anyone who remembers when I used to run marathons regularly, you know that a garbage bag is pretty much a staple to bring to any race as are my running shoes. Not only can it be used as a rain jacket. But it can also help you keep warm before a race, and if you are in crazy stormy winds, it can act as a windbreaker. However the trick is, besides poking a hole for your head and arms. (I don't recommend doing this ahead of time, you don't want holes any bigger than nice and snug as you poke your arms through.) But the trick is to make sure you don't wear it too long to the point where you start sweating in it. (Tip, sometimes I will bring two bags. One for before the race, and one just in case I need it during. 3. Nice pair of tights. If you've ever ran in cold wind, rain or snow you know a great pair of tights can be the difference between being comfortable or miserable in a race. You want a pair that will not soak up any rain, a pair that dry quickly and hug your body snug even if they are soaked. But be careful, if the temps are going to be warm and stormy you don't want to overdress. Usually if you see temps forecast for below 40 degree's. Or even below 50 and cloudy, tights might be a good option. 4. Pack something warm and dry in your gear bag. So when you finish the race, you can immediately toss off the wet shirt or tank and throw on something dry and warm. 5. Use lots of lube on your feet. While this is a given for just about any race or longer distance any time of year. If the weather looks to be bad, you are going to want to cake it on even more than normal. I always use Vaseline, but I know many runners also use Body glide. 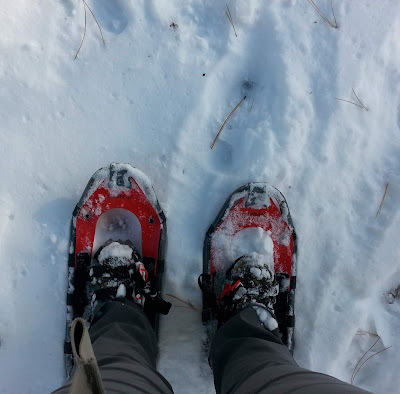 This does a couple of things, reduces friction and any chances of blisters. But can also act as a block against wetness that comes to your feet in bad weather. On that note, if its going to be a really stormy cold day, it may not hurt to put some on your legs and arms (the parts that are going to be exposed) as well to act as a repellent. But be careful, don't put it on your head or neck and don't completely coat your arms and legs, after all your body needs to breath and sweat properly! 6. Dress in layers, and make them disposable layers. This is especially helpful if it's going to be freezing early on, with a chance of warming up later in the race. Don't bring your nice stuff you want to keep with you as the layers, pick up something at a second hand store, or somewhere that you don't pay too much and won't be bothered when you shed it and never see it again. I also always recommend a cheap pair of gloves! Even after shedding a jacket or long sleeves, sometimes a nice pair or warm gloves can make a huge comfort difference in a race. 7. If it's windy, lean into it. Tip your head down, and don't let your face take the brunt of it. Also, if you lean correctly you can actually create a better running form that will help you from slowing down too much in the winds. But on that same note, go ahead and use someone in front of you as a blocker. They may not like it, and if they don't they will either slow down or speed up. But there is no harm in using the person in front of you while you can to block the elements. Just be kind and don't run too close and remember someone may want to use you too. 8. Train for it. If you only train your mind to run in good weather, your setting yourself up for problems. If you skip each training run on bad weather days then you aren't using your training period to your full advantage. Training means more than just conditioning your body. It's also for teaching you how to do a number of things, and that includes running in bad weather. So next time you see a stormy day, don't be a wimp. 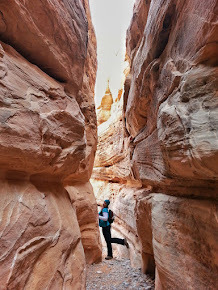 Embrace it for your long run and teach your body to work well in different weather. 9. Remember during the race that this is all going to make you a stronger runner. Also sometimes what may start out as miserable may end up being quite enjoyable if you give it a chance. It's only temporary, it will also be over before you know it and you will have some awesome stories to tell your friends after! 10. Use mind control. If you think you are miserable, you will be. If you think you are going to be cold or are cold, then you will make yourself feel colder. If you plan to complain the entire time, you will! But if you think it will be fun, it will be. If you tell yourself you can do it and it won't be so bad, it wont be! And that's the truth!!! So tell me, what is your biggest tip for running Spring Races in Bad Weather? When I just started getting blisters & read to lube up the feet, I thought that was the weirdest thing ever - but I totally lotioned up my feet this past 10 mile race & had no issues. I'm all about it now! I hate running in the rain. I have had to run 3 half marathons in the pouring rain. All your tips are good ones. And to remember, everyone in the race is facing the same conditions. Sometimes I have found that bad weather isn't always miserable, sometimes its fun. But when you add those cold wet winds, yeah it sure can make a miserable run. Hope the winds will hold off for ya in your race! But yeah, lean into the wind, head and heck and slightly dip your back it gives you kind of a more aerodynamic feel to it, and you can power through crazy winds with not too much change in pace. Glad you found your way to it, it makes a huge difference! My advice? Run outside no matter what the conditions. Living in the midwest, you really get a roller coaster of weather, especially in the spring. 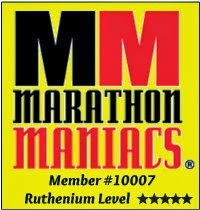 It makes you a tough runner, mentally and physically. I've run races in just about every condition except a blizzard. And while it's not always fun when the weather is bad, I never quit because of the weather. Great tips! I try to train in all different conditions so I'll be prepared for most anything - wind, rain, cold, full sun. Mindset really is everything! Running in these conditions isn't fun, but you do feel like a bada$$ when you've finished! Being able to get in something dry when you get done running is key. I have made that mistake at a 10k I ran. The race was great but I was stuck in wet clothes for a few hours after and got sick. You freeze the second you stop running lol even if it is pretty warm. All great tips. I always make sure to have a warm pair of dry clothes waiting for me at the end of a race. The last thing I want to do is be cold! Number 8 is the most important tip. Most runners refuse to train in the rain and then are in big trouble on race day. Several times I have slogged through the rain so my race experience could be a good one whatever the weather. I also like our idea of two garbage bags. I usually buy the disposable ponchos in the camping department at Walmart! Yes, to wearing layers - the best advice! Great tips Kristy! A throwaway at the start is very helpful! The mental game is key too. Try to keep positive!